THE RACE HAS BEEN CALLED … FOX NEWS CALLS THE RECALL ELECTION … WALKER AND KLEEFISH WIN!!! With 26% of the vote counted FOX News has called the race for Governor Scott Walker and Lt. Governor Kleefisch. This represents a huge loss for unions and Barack Obama. Governor Scott Walker becomes the first US governor to win a recall election in US history. What a waste of tax payer dollars for this recall election. The voters of Wisconsin have spoken, the same as they did in 2010. 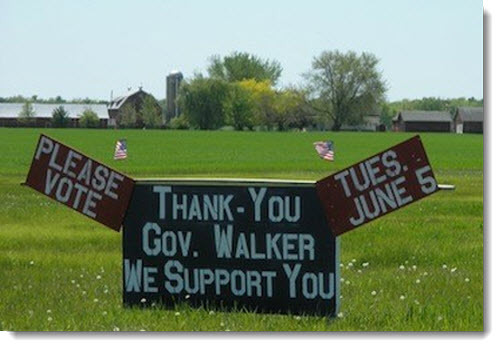 As reported at the Gateway Pundit … WALKER WINS BIG ANYWAYS!!! All the busing in of out of state union voters still could not tip the tide of this resounding Scott Walker victory. But of course Eric Holder and the DOJ would never have looked into that. MSNBC is also calling the recall election for Gov. Scott Walker. Wisconsin Gov. Scott Walker survived a furious recall campaign on Tuesday, emerging as the victor in a bitter fight over state budgets and collective bargaining rights. NBC News declared Walker the projected winner over Democratic challenger Tom Barrett in a closely-watched campaign first prompted after Walker drove a bill stripping public employee unions of their collective bargaining rights through Wisconsin’s legislature showed little signs of abating, according to exit polls. In a state that Barack Obama won by 14% in 2008, the Democrats and unions fail in the 2012 recall election of Scott Walker. However, what does it say when Barack Obama does not lift a finger to help Democrat challenger Tom Barrett and the union workers that Obama constantly panders to? Just curious Wisconsin Democrats, why would anyone help Obama when he obviously abandoned you in your time of need. Obama wanted no taint left on him, that’s how committed he was to union workers. How does Barack Obama come back to Wisconsin and pander for votes and that he feels them when he could not be concerned to help the Democrat challenger Barrett? Why would anyone give Obama the time of day in Wisconsin when the Obamamessiah left Democrat Cheese heads high and dry. UPDATE I: Wisconsin voters reject recall.Wisconsin is now added to the list of battleground states for the 2012 election. A state that Obama won by double digits in 2008 will now have to be defended. Wisconsin voters rejected a year-long effort to recall Gov. Scott Walker and replace him with Democratic challenger Tom Barrett. ABC News projected Walker would win the race and hang onto his job one hour after polls closed. The recall started last year as a state fight over Walker’s efforts to curb public unions in his state. But with its fierce debate over how to resolve the country’s budget woes and tens of millions in outside political money pouring into the state, the recall morphed into what many viewed as a preview of what to expect this fall when Obama battles GOP nominee Mitt Romney for the Oval Office. The victory is a boon to Walker and Republicans in this key battleground state that opted for President Obama by nearly 15 percent four years ago. It may also be interpreted as a validation of Walker’s confrontational efforts to curb public employee unions. 41% of vote counted: GOVERNOR: Walker (R): 59% – Barrett (D) 41% … LT GOV: Kleefisch (R) 59% – Mitchell (D) 41%. UPDATE III: What will be the ramifications of the recall vote on the November elections? RNC chair Priebuspredicts Democratic ‘circular firing squad’ and says that Obama left the Wisconsin Democrats at the alter. 76% of vote counted: GOVERNOR: Walker (R): 55% – Barrett (D) 44% … LT GOV: Kleefisch (R) 55% – Mitchell (D) 45%. A 20 point lead at the 73 percent mark. This is too big for the Socialist/Democrats to stuff the ballot boxes. The whole western part of the state that is normally a Democrat territory voted for Walker and Kleefisch. We don’t have any information in the senate races. These are very important to win.